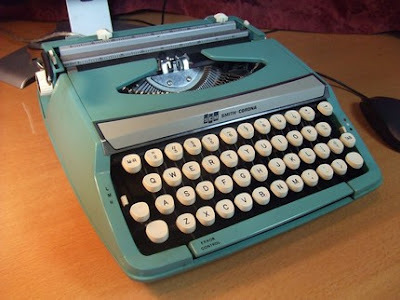 "The USBTypewriter™ is a new and groundbreaking innovation in the field of obsolescence. Lovers of the look, feel, and quality of old fashioned manual typewriters can now use them as keyboards for any USB-capable computer, such as a PC, Mac, or even iPad! The modification is easy to install, it involves no messy wiring, and does not change the outward appearance of the typewriter (except for the usb adapter itself, which is mounted in the rear of the machine). So the end result is a retro-style USB keyboard that not only looks great, but feels great to use..."
Here is how it works, cute and ultra-retro though i think i would rather have one of these.